After a winter beset by flu and medieval problems which I’ll divulge in due course, I ran away to Athens. Despite the obvious increase in homelessness and darned clothes, even since I last visited in October, the Athenians are resilient and still go for strolls to enjoy their lovely sunsets. Sunlight there has not (yet) been sold off to any global corporation. On Tuesday I received the greatest compliment of my life, an Honorary Doctorate from Athens University. There is no institution in the world from which I would rather my work received recognition. Inducted by Professor Walter Puchner, I was given a beautiful scroll and a sash, blue with white goose feathers: serendipitously, my acceptance speech explored the possible reasons why it is a goose that Aristotle is waving a knife at on the university’s famous fresco. Before the ceremony, the Rector and Deans took me upstairs to make sure I was lent the right size of gown. These are elaborate in design, reminiscent of stage stereotypes of Japanese or Chinese authority figures. Looking back at other Athens Honorary Doctors gives me impostor syndrome, so vastly more important has been their contribution than mine. But it was size that was on my mind. It is obvious I did not wear exactly the same costume as tall Derek Walcott, nor the much lamented six-footer Umberto Eco. 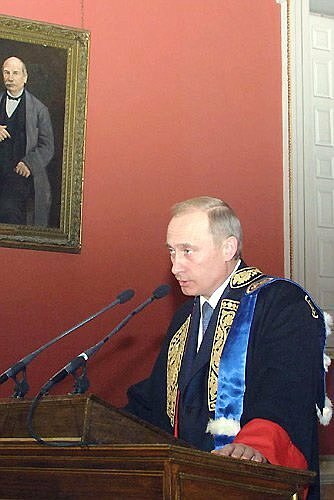 Vladimir Putin is less tall. 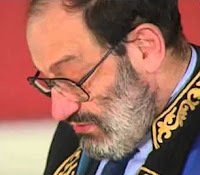 I fear that I wore the very same garment as he did in 2001. I hope I do not develop ambitions to invade Crimea. 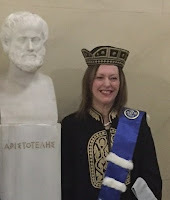 I do not know the height of soon-to-be fellow-Hon-PhD-Athens, European Central Bank President Mario Draghi; is it too much to hope he will wear the same one as I did and it transmits to him some sympathy for the Greeks’ plight? Despite staying out late on a dance floor slurping Pina Colada, I scaled the Acropolis on Wednesday, with daughter Sarah, long-time co-conspirator Dr Rosie Wyles and her husband Mr Holmes. 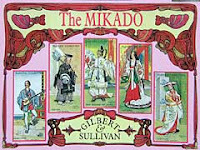 On the plane home I dreamed I was being directed by Mike Leigh in a performance of the Mikado’s song My Object all Sublime. Is it a sign of incipient megalomania that in the dream I was bursting with joy? Congratulations on your Hon. Doctorate. I am all agog to hear about the goose, as well. What was your conclusion? 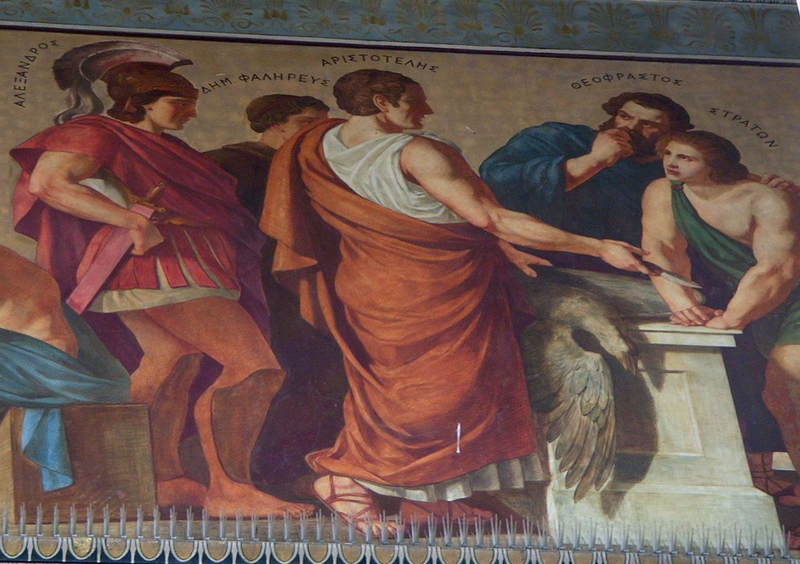 I believe Aristotle is going to sacrifice the goose. Personally, I have not yet seen goose on a list of sacrificial animals; but, it does look to all intents and purposes like a sacrifice.